One of the oldest monasteries in the Bulgarian lands, it rises in the picturesque Chaya river valley, 29 km south of Plovdiv, toward Smolyan. 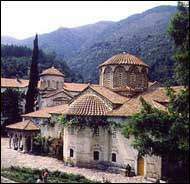 Founded in 1083, Bachkovo Monastery is chiefly known for its original architecture, rich collections of old icons, jewelry, coins and church plate. The library preserves many valuable incunabula and old manuscripts. Its most remarkable feature, however, are the paintings that are seen everywhere - in the church and ossuary, where the figure of the Bulgarian Tsar Ivan Alexander is discernible among the I I th and 14th century murals, in the refectory (1601), in the Assumption of the Blessed Virgin main church (1604), and in the Holy Trinity and St. Nicholas church (I 840), which contain some of the first murals painted by the celebrated National Revival artist Zahari Zograph. Smolyan, April 28 (BTA) - Foreign Minister Solomon Passy was familiarized with the idea of the Nedelino municipality for the establishment of a NATO military base near the town, Nedeleino Mayor Stoyan Beshirov told BTA. The Foreign Minister spent the Eastern holidays with his family in the town. He was named honorary citizen of Nedelino. Visiting National Assembly Foreign Policy, Defence and Security Committee Chairman Stanimir Ilchev and five MPs of the Simeon II National Movement were also familiarized with the proposal.The local citizens firmly support the initiative, said Beshirov. In his view they were impressed by the benefits for the local population of Sarafovo, where US military were deployed due to the war in Iraq.